Bowing to pressure from animal-rights groups that has hurt attendance, SeaWorld Entertainment plans to phase out its iconic killer whale show in San Diego and replace it with a conservation-oriented whale exhibit. The Orlando-based company announced the change in strategy on Monday during a webcast for securities analysts. SeaWorld’s stock rose 2 percent to nearly $19 after the first report of the phaseout. Joel Manby, president and CEO, outlined a five-point plan to “stabilize and grow the company” that involves focusing on conservation, education and exploration. “I see a company that’s focused on protecting wild animals and wild places,” he told the analysts. “We’re not limited to any one animal, to any one show, to any one attraction,” he said at the beginning of the presentation. Last month the California Coastal Commission approved the $100 million Blue World plan to expand the killer whale tanks, but said the park could not breed the whales in captivity, a restriction that would gradually bring the shows to an end. Manby said a third to a half of the investment planned for Blue World project would now be diverted to other uses as a result of the change to a conservation-oriented exhibit. Manby said that over its 50-year history, SeaWorld had rescued 27,000 animals — a record he said was unequaled in the world. SeaWorld critics were not impressed. 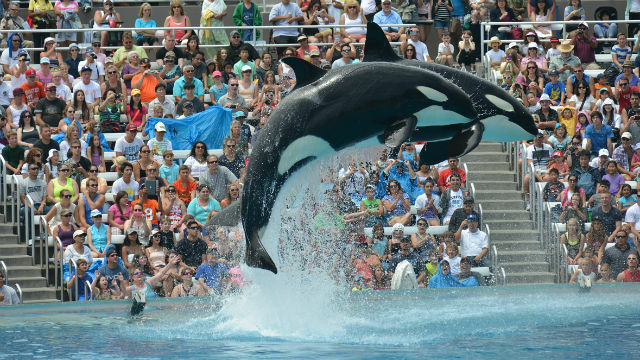 And Naomi Rose, a marine mammal scientist with the Animal Welfare Institute, said she suspects SeaWorld might be replicating an Orlando show last year when the performance pool was closed for renovation. “They did a more ‘informational’ presentation — no loud music, no dancing, no stadium seating – people could stay at poolside all day if they wanted, watching how the trainers did veterinary sampling, trained the animals to do new behaviors (tricks), and so on,” Rose said. Rep. Adam Schiff on Friday announced he would introduce the Orca Responsibility and Care Advancement (ORCA) Act to phase out orca captivity. On Monday, the Burbank Democrat called SeaWorld’s decision a welcome step. “Much more needs to be done, however, and I would urge the company to curtail the breeding of their orcas and partner in the creation of ocean sanctuaries,” Schiff said in a statement. — Ken Stone contributed to this report.